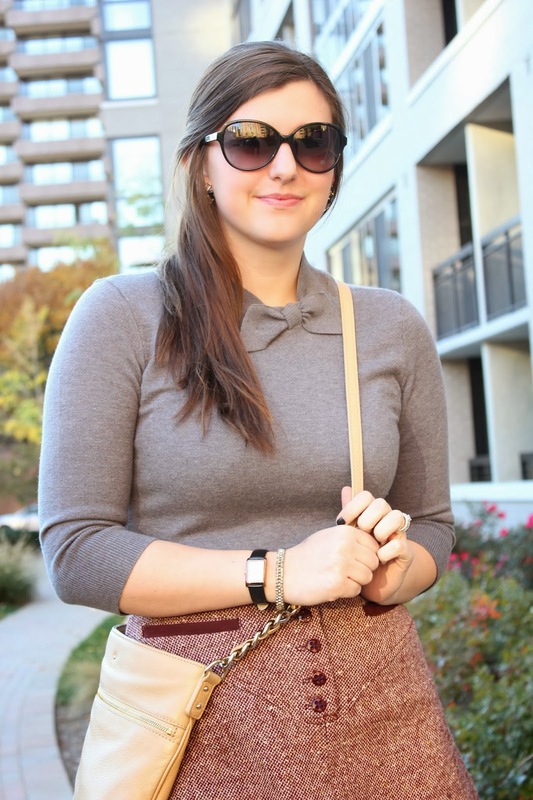 skirt:vintage (mom’s from high school), sweater:kate spade, booties:kate spade, crossbody:kate spade, sunglasses:dvf, bangles:kate spade, stella&dot c/o meredith king, earrings:kate spade, cooper watch:kate spade. one thing that i am so thankful for my mother doing is keep her old clothes from high school for me and my sister. it is so fun to see the style she liked and to realize how much we may be alike. i have used and reused the items she has passed down to me. this skirt is just one of the many items that is in a constant cycle in my closet. thanks mom! This outfit is adorable!! Loving having the tights paired with that skirt! I love this whole look. It's totally my style! Oh my gosh, I love the skirt! Your mom has good taste! And those booties are amazing! Such a cute look! You look so cute! I love the look. No way!!! I can't believe that skirt belonged to your mama! How cool! It's totally in style!!! I love it! And it looks adorable with the bow sweater:)! Great style, mom!